Written by Peter Conrad I want to inspire you with a cozy place in Costa Rica to take your sweetheart on a romantic weekend break. L’ Acquaviva Resort & SPA with fancy architecture is located close to the Ostional National Wildlife Refuge and the beautiful beaches Nosara, Garza, Guiones and Pelada. 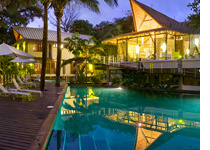 It has 35 rooms which are separated in bungalows and are surrounded by pools and water courses. The rooms and suites are equipped with air conditioning, coffee maker, television, working space, hair dryer and safety box. Also, they have a spacious balcony. Is an adorable experience to live with your couple L’ Acqua Vica offers a true romantic affair on an intimate level; you will be enchanted by its elegant charm. Ostional has really preserved the small town feel with its narrow trails, lush nature and beautiful sunsets every day. A highlight at L’ Acquaviva Resort & SPA Costa Rica is "Coral Creations", an amazing living Corals Garden, an inimitable attraction, featuring one of the most complete collections of living corals, gathered from all our Planet’s Oceans. Live water will continue pampering the guests in this oasis, haven of peace. Get balanced at their spa and beauty parlour. Flowing water and Nature will inspire you, while practicing meditation and yoga at a riverside. Dare to a full immersion in this live element at "Ocean Secrets", our scuba diving station, or practicing snorkelling, surf, and many other Watersports. This is the ultimate choice for romantic weekend breaks, and summer is a perfect time to visit Ostional National Wildlife Refuge to enjoy an amazing time. The Costa Rica Hotel which is considered as surfers’ Paradise offers a bar, a delicious restaurant and good service to guarantee an enjoyable stay. What to do in Monteverde? My wonderful journey to Monteverde Cloud Forest. A rainforest you have to visit at least once in your life!